When you speak with Maricarmen, it is clear that music chose her, and that she has followed this calling from a very young age by dedicating her whole life to composing, playing the guitar, bringing a wide range of Yucatecan and Latin American songs to life with her virtuosa voice, and by researching and promoting Yucatán’s musical culture and artistic wealth throughout the world. In addition to all this, she is a fantastic conversationalist who tells you the stories of her beginnings in such a way that they become music to your senses. 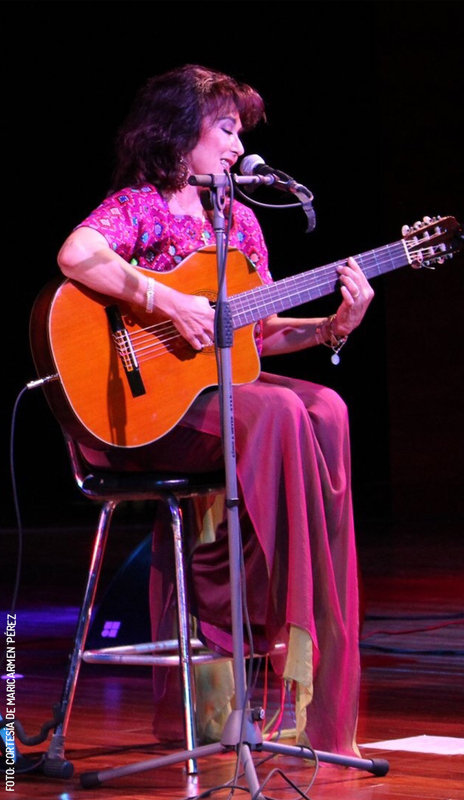 You can almost experience these stories alongside her: the first time she touched a guitar when she was 11 years old; her “love at first sight” with bossa nova; and the bravery and empowerment she has always admired in singers like Chabuca Grande, that she herself transmits today whether as a soloist with the Orquesta Típica de Yukalpetén or when performing trova at one of her presentations. Listening to her is a total delight and a learning experience about music, culture, and history. Maricarmen takes each one of her presentations to the next level, sharing all sorts of information with the public such as details about the composer, musical genre, and even about the clothing she wears. “Singing before an audience in another place or country is a huge responsibility, because music is a reflection of everything which happens in a social, economic, and political environment, and is absorbed by those who perform music,” she notes. Because of her impressive oeuvre, the Museo de la Canción Yucateca has named her the “International Ambassador of Yucatecan Music.” Personally, I would also name her as a generous artist. Maricarmen is generous with her music, her words, and her time. It is said that those with a virtue express it in everything they do. In her biggest passion, music, she has found a way to express other interests, such as anthropology and history. By combining these aspects, she achieves a detailed historic and cultural preparation for each concert and presentation she gives. In recognition of her work in the research and dissemination of Yucatecan music on the world stage, she was inducted to the Songwriter and Interpreter Gallery at the Museo de la Canción Yucateca. With a career which spans over 45 years, she is a tireless cultural promoter who is always willing to share her talent and the stage with other colleagues at festivals, both here and abroad. Through her work she has helped promote many local groups internationally, including: Los Juglares, Trio Trovanova, Los Tachos (originally from Valladolid), and Presentimiento (Campeche), among others. She has held concerts in Spain, Portugal, Morocco, Israel, Cuba, Puerto Rico, Columbia, Ecuador, Guatemala, Venezuela, Panamá, and Paraguay. In collaboration with the Mexican Embassies in the United States and Canada, she has given conferences and didactic concerts specialized in Mexican music and Yucatecan trova in both English and Spanish. Currently, she is Mexico’s representative at the Fundación Pro Música Nacional de Ginebra (Funmúsica) and the Festival Mono Nuñez. In 2018, she received the Silvio Zavala medal given by the city of Mérida for her contributions to culture and the arts. She was also recipient of the Pastor Cervera medal, given by the Ministry of Culture and the Arts, the Sociedad Artística Ricardo Palmerín Pavia for a life of work in trova, and the 2016 Chan Cil medal on behalf of the city of Mérida in recognition for over 40 years of a career in trova. She has received numerous other awards for being a female artist, creator, and business woman. With 11 albums in different genres (bolero, bambuco, bossa nova, trova), her musical beginnings go back to the year 1972’s Youth Trova nights. Since then, she has participated in numerous groups, with Clan’67 being the first of many. She has performed with Sergio Esquivel, and in 2005 she formed the group “Ellas Son” alongside Ligia Cámara and Angélica Balado, among other singers. She has been the Artistic Director of the International Bolero Festivals in Manizales and Pereira, Colombia. Currently she performs with the Orquesta Típica Yukalpetén, as a solo artist at bilingual didactic concerts, especially with the Mérida English Library, and continues to organize cultural activities with the foreign writer community of Mérida. Adviser, promoter, and creator…these are just some of the words that can be used to describe Maricarmen. She’s an artist that finds a special place in your heart when you meet her because of her warm demeanor, which, just like her music, captivates the senses and becomes unforgettable.